Volleyball Positions What Are They on the Court? What Are They on the Court? What position in volleyball do you play? The roles and primary volleyball positions on the court: the setter, hitters, middle blockers, defensive specialists and liberos and the responsibilities they each have are usually explained as soon as you join a new club, high school, college or professional six player team. the libero which differ greatly just like the physical requirements needed to play each position do. Setters are the unofficial leaders on the court. Although it may not happen all the time, setters are trained to get to and attempt to set every second ball to one of their three front row or any of their two non-libero back row attackers or players so that they can hit the ball over the net. 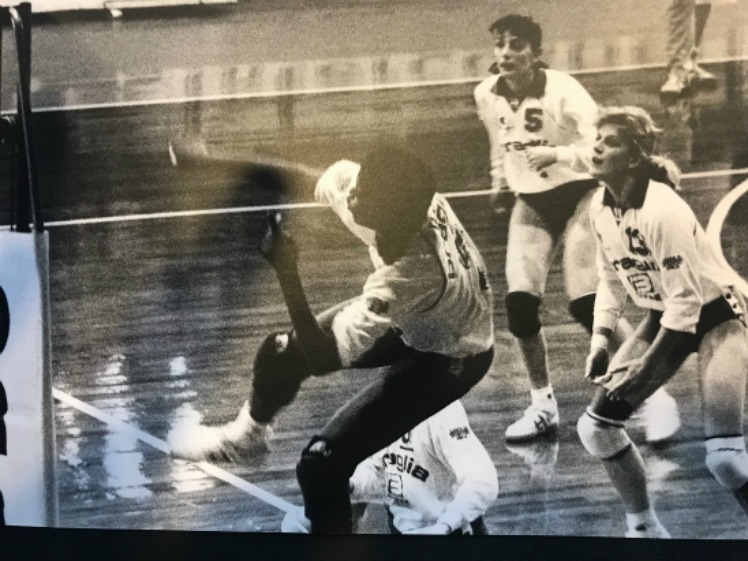 The setter runs the team's offense by telling or signalling each of her intended hitters, before the referee blows their whistle, what kind of set she is going to deliver to them. The setter's job is to outsmart the opposing team's block so that her hitters hit the ball with the least number of opposing blockers trying to block their spike attempts. The role of the setter can be compared to that of a quarterback on a football team. 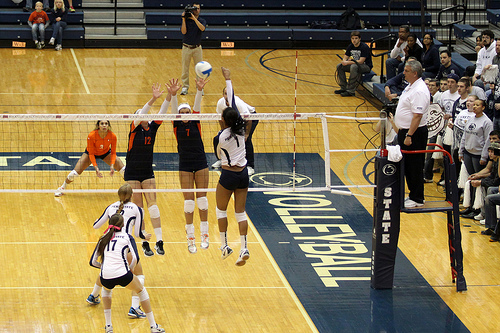 Setters call the plays, then they run the offense. 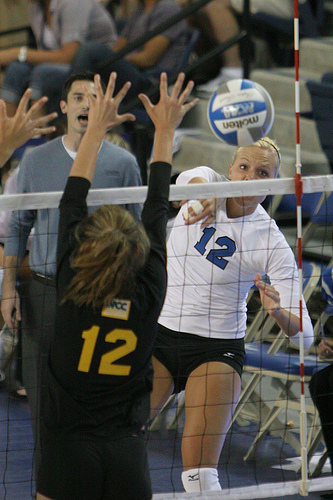 Shot callers or playmakers, setters are in charge of getting the second ball to one of her hitters and she chooses which one. Ideally, the players in these roles should have good leadership qualities because they take on the responsibilities of leading and guiding the team while they are on the court. Confidence is another key quality all setters should have because their job is to keep an eye on the opposing team's defense during each rally so that they can see where there are holes in the block and/or where there are weak points in the opposing team's defense. Once they identify those weaknesses they will set the ball to their hitters that can hit the balls at or through those holes so that her team scores points consistently. The goal is to exploit the weaknesses in the opposing team's block and defense. If you are a setter then you are in charge of directing your team's offensive attack, just like a point guard on a basketball team would. Read more about sets and setters. Middle blockers are usually the tallest players on the team and you can compare the middle blocker to the defensive linebacker in football and the center on a basketball team. In the photo below the player wearing the #21 jersey is playing in the middle blocking position for the Illinois State Redbirds collegiate team. Their primary responsibility once their team has served the ball is to travel laterally along the net in such a way that they put up a block, either by themselves or with the help of their outside blockers, against any of the hitters on the opposing team in an attempt to stop them from hitting or tipping the ball over the net and into their court. If a team is on offense, and by this I mean if they are about to be served the ball, then the players that were middle blockers become middle hitters. Middle hitters or middle attackers specialize in hitting the ball from the middle area of the net which is called zone 3 on the court. NCAA champion, Stanford women's volleyball middle blocker Inky Ajanaku, '16, provides a behind-the-scenes look at her typical game day and shows how the Buck/Cardinal Club supports her and her teammates in their championship pursuits. On each team there are usually two middle blocking/hitting players, one that plays in the front row while the other plays opposite them in the back row. If a team is in the correct rotation, then one middle blocker rotates up to their front row, when the other one is rotating back to the back row. And you're right, two middle blockers can never play in the same row together. Read more about blocking and middle blockers. Liberos are specialized volleyball positions on the court for those who excel in passing the ball, playing defense, serving and setting the ball in the backrow. The word "libero" means "free" in Italian and it refers to the libero's ability to move freely in and out of the back court since they can take the place of any back row player. The role and requirements of the libero were invented to be one of the volleyball positions on the court that's exclusively limited to the back row. What can the Libero do and not do? I would compare the libero position to the pinch hitter in baseball. Her role calls for her to be the one back row player to go in for a front row player when the front row player rotates to the back row. The libero's volleyball jersey is always in contrasting colors to that of her teammates since she only plays in the back row. If you were curious as to why one of the players always has a different color jersey than their teammates, that's to identify them to the referee, as to which player is the libero. She can come in and out of the game an unlimited number of times as long as she comes in for the same player each time. If you're one of those girls who may be the shortest but the quickest on your team, the libero could be one of the volleyball positions on the court which could be a great option for you to aspire to be. You can really make a huge difference on your team in this position and being a starting libero guarantees you plenty of playing time during each game. 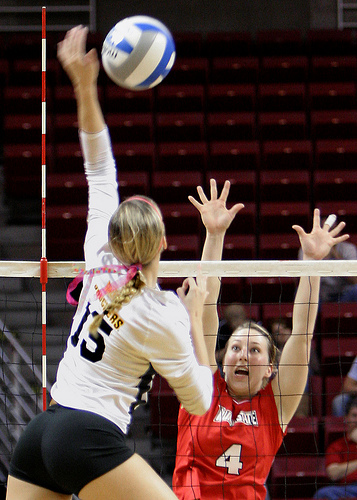 The libero is not allowed to hit the ball when any part of the ball is above the level of the top of the net. Although she can't block the ball, or attempt to block it, a libero can set one of her other players if they are in the backrow or front row. Professional left side outside hitter April Chapple in Italy during the Division I Italian championship finals in Reggio Emilia. I'm partial to this position, because it's been my favorite of the two volleyball positions on the court I've specialized in throughout my career as a high school, collegiate and professional player. Players who play in this position are also known by another slang term as left side hitters. They are referred to as "cannons". Left sides are called the "cannons" because even though they play their offensive position the furthest away from the setter, they are quite often the hardest hitters on the team. If the setter can be compared to the quarterback or point guard, then the outside hitter or spiker would be considered the running back or wide receiver in volleyball. 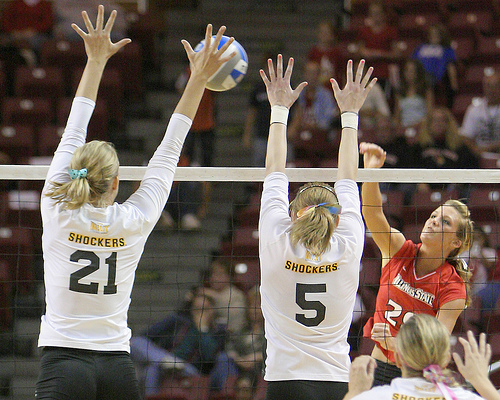 The "outside hitter," the "spiker" or the cannon "receives the ball" or gets set the ball in many different occasions, usually as the third and last contact allowed for a team. The outside hitter, usually has the third contact on the ball and is responsible for sending the ball over the net into the opponent's court with the goal to score a point. Regardless of the accuracy of the set an outside hitter may get, they are responsible for attacking the ball so the end result is a point or sideout. The outside hitter has a selection of ways to attack the ball which include spiking, tipping, setting, dumping the ball, or attacking it with an off-speed hit. 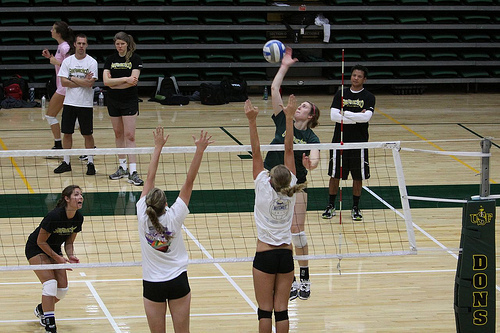 An outside hitter can kick the ball over if need be. Their primary job is to score offensive points. They are quite often the athletes on the team who are quick, jump high, and are physically coordinated and agile. They train in practice to hit all sorts of sets so that they can beat the block by hitting the ball...hard...repeatedly. If a setter is in trouble, the easiest thing for her to do, is to set the ball to her left side hitter. Many times these aren't perfect sets, so a left side hitter puts in hours of training to hit imperfect sets, so that they can still score points or hit sideouts off the sets that aren't right where they are supposed to be. For some, left side hitters are referred to as "vacuum cleaners" because its their job to clean up all the trash. 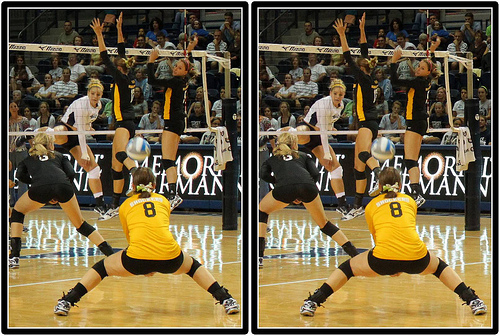 No offense to anyone, that's just what a player in one of these volleyball positions on the court specifically on the left side is often called. Just like there are two middle blockers on every team, there are two left side hitters per team, so when one is in the front row, the other plays opposite her in the back row. And just like middle blockers, if a left side hitter is on defense, then she becomes the left side blocker. If two middle blockers play opposite each other on a team, and two left side hitters play opposite each other, then who plays opposite the setter? That would be one of the final positions on the court to talk about which belongs to the offside hitter, also known as "the opposite" or right side hitter. Lots of name for lots of responsibilities. First, because the right side hitter becomes the right side blocker when her team is on defense, she is lined up to block the left side hitter of the opposite team. 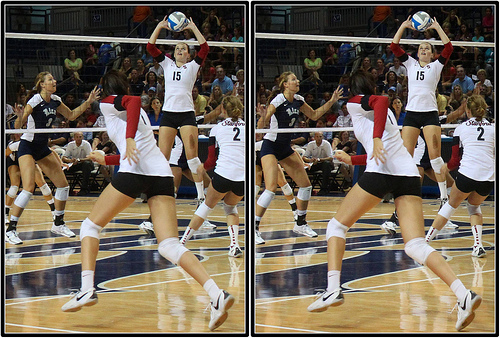 Remember the left side hitter is usually the more prolific hitter on her team, so the opposing right side blocker has a pretty important job, trying to block the ball hit by one of the best athletes on the opposing team. This alone often makes the right side hitter position one of the toughest positions on the court to play in. Another responsibility of the right side player occurs when her team is on defense. She sets the ball, usually a high ball out to her middle blocker or opposite hitter. When the right side player rotates to the back row to play defense, the setter who plays opposite her/him rotates up to the front row. 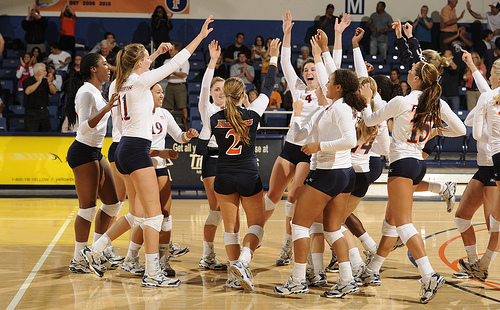 Learn more about the various Positions in Volleyball by reviewing the Related Links below.